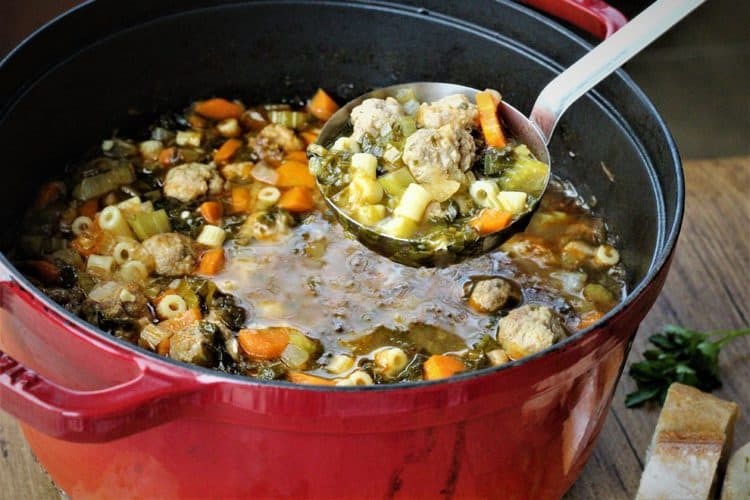 Escarole and Meatballs Soup, otherwise known as Italian Weding Soup, is the perfect one pot meal! 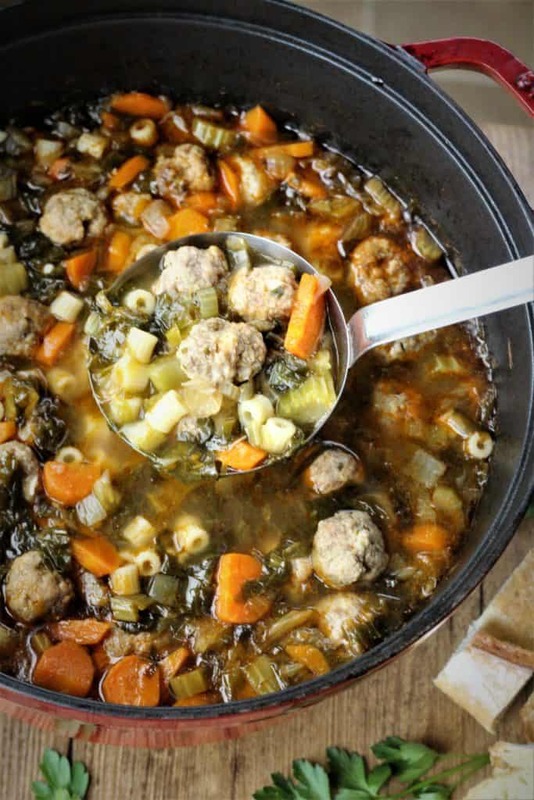 I had originally set out to call this recipe Italian Wedding Soup, but I decided not to. 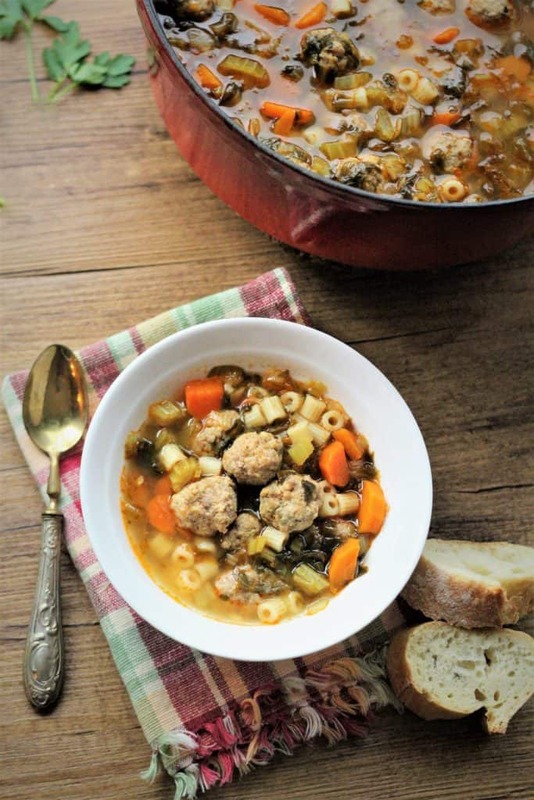 I know that most of us refer to this soup as such but really, what is ltalian Wedding Soup? First of all, how many of you have actually eaten this soup at an Italian wedding? I definitely have never eaten this at any wedding. Back in the old days we were served a bowl of stracciatella (egg drop soup) with acini di pepe pasta following the antipasto. But that has long been omitted from most Italian wedding menus. Let’s talk about the origins of this soup. There is in fact such a thing in Italy called minestra maritata which literally translates as “married soup”. The “married” part refers to the combination of greens (escarole, spinach, swiss chard or other) and meat with the addition of some type of pasta. Somewhere along the way, “minestra maritata” was translated using the word “wedding” in order to refer to the marrying of the greens and meat. Therefore, it had nothing to do with weddings in the literal sense. Yet another North American adaptation of an Italian recipe. Fascinating, isn’t it? Can I substitute other greens? Most recipes I’ve seen add spinach. I prefer escarole (which my mother always uses) as I like the way it holds it’s shape in the soup. But you can substitute spinach if you prefer. I’m also partial to using tubettini pasta in hearty vegetable soups but again, any other small shaped pasta will do. I’ll tell you the truth, this is not my mother’s original recipe. She made a soup with escarole and ground meat and called it escarole soup. It was very good but I decided to modify the recipe by turning the ground meat into meatballs. Because who doesn’t like little meatballs in their soup? The best part about this soup is that it’s a one pot meal! The meatballs cook in the broth, at the same time adding lots of flavor. This hearty escarole and meatball soup is the perfect weekday family meal. Just add a salad and fresh bread for a complete meal. In a large bowl add all the meatball ingredients and mix well. 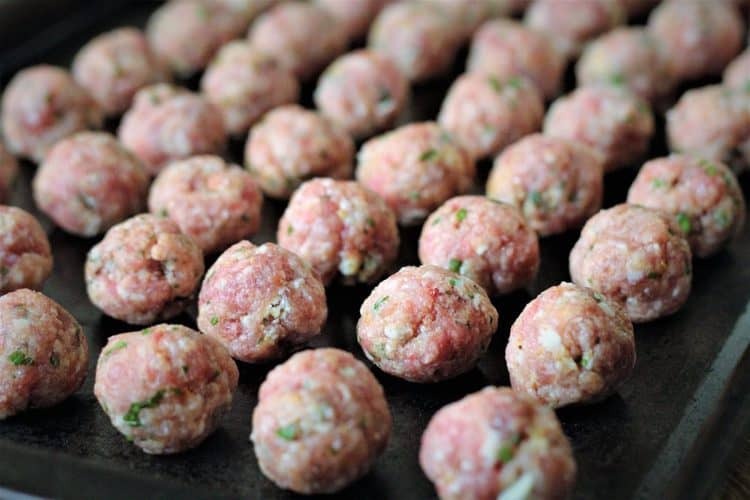 Shape the meat mixture into meatballs approximately 1 inch. Set aside while you prepare the soup. Heat olive oil in a large dutch oven, add onions and sauté for 5 minutes. 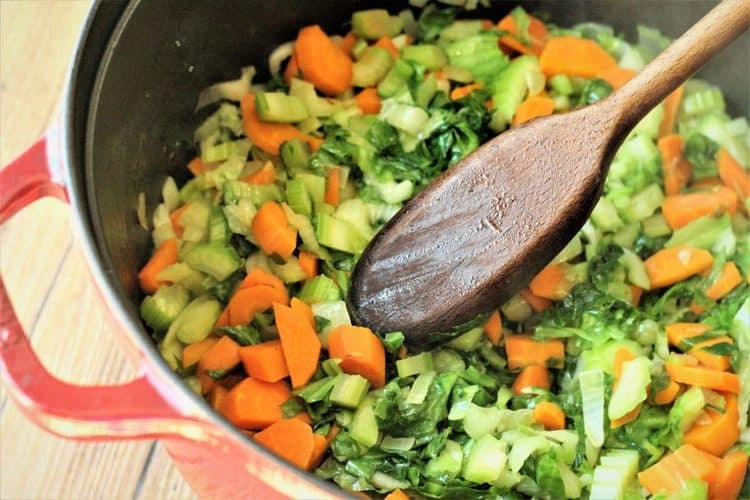 Add the carrots, celery and garlic and cook for 5 minutes, stirring occasionally. Stir in the tomato paste and mix well with the vegetables. Add the escarole and stir until wilted. Pour in the chicken stock and bay leaves and bring to a boil. When the soup comes to a boil, add the prepared meatballs. Lower to a simmer and cook with the lid on for 30 minutes. Remove the lid and stir in the pasta. Cook until the pasta is ready, according to the package instructions. Add salt and pepper as desired. Remove and discard the bay leaves before serving. Serve hot with parmesan cheese at the table. Spinach may be substituted for the escarole. Acini di pepe pasta is typically used in this soup but any small shaped pasta will do. Please note that the nutritional information is approximate and may vary according to exact portion size. This was my favourite kind of soup growing up and still is. 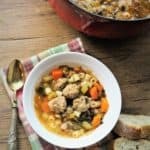 We too never called it Italian wedding soup. It was always zuppa con polpetta to us! Absolutely delicious Nadia! To tell you the truth, I didn't like eating greens when I was a kid so I didn't like this soup. Now I love it and thankfully my kids like it too! Thanks for stopping by Marisa! Your recipe is almost identical to mine. I don’t make it the way my mom did either. Actually she never showed me and I just went by what I remembered. I use orzo for the pasta and no garlic except in the meatballs. Everyone loves this soup. My favorite as well. Thanks for sharing the recipe and the origin if why it’s called wedding soup. Very interesting. Hi Patti, it’s always been one of my favourites as well. Thanks for your feedback! Your recipe is exactly like my mama made and my 5 siblings and I still do. She called in Minestra too and I had never heard of "Italian Wedding Soup" until a few years ago when I first learned to use my computer and began looking for recipes online. 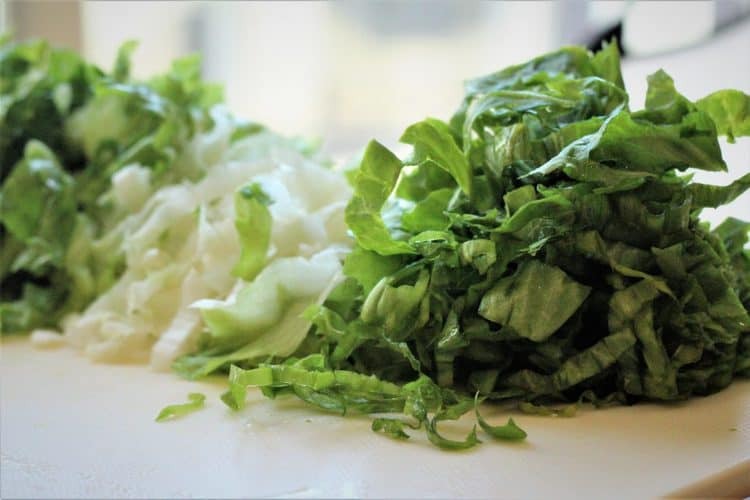 We always use escarole and Easter is not Easter without serving this as a first course right after our antipasto. It is so refreshing to read your recipes from Sicily so much akin to my family's, mama from Naples, papa from Calabria. Thanks a bunch - I'm so glad I found you! Hi Anna, I'm so glad to hear that! We never called it Italian Wedding Soup either, it's a north American invention. It's interesting to hear that you made it for Easter, this I never heard of. So nice to hear about the various family traditions. Thanks again for stopping by my blog! Nadia, different topic altogether ... I tuned into your u-tube video where you made Sicialian Cassatelle with Ricotta. Unfortunately the sound was bad, don't know if it was from my computer, so I did not get the proper ingredient measurements. 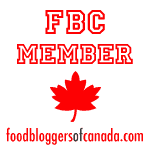 I wonder if you could post the recipe and procedure here on your blog please. Also, what is not clear to me is if these should be served warm, room temp, or can they be eaten cold? I so appreciate your indulgence here Nadia. It is so joyful for me to have found your blog. I get so much pleasure reading here and want to thank you sincerely for your efforts to preserve our heritage. Hi Anna, you can also find the complete recipe for cassatelle on my blog. Just type cassatelle with ricotta in the search bar on the right. To be honest with you I ate them warm, room temperature and cold. They're always good! Thanks for your lovely comment Anna!